Technical Data Sheet Wipe clean high strength and durability to cleaning detergents in combination with wet. Ideal for fast drying of surfaces. Absorbs and removes grease, oil and chemicals. Features: • High absorption capacity up to 800% of its own weight in chemicals, grease and oils • High strength even when it is wet • Impervious to cleaning liquids like solvents • Reusable and economic, it can be drain • No clear lint when it is wet, even when rubbing • Its soft touch protects the treated surface without scratching • Do not burn or flammable, just melts in connection with fire action. Scope: Ideal for cleaning, drying and maintain all types of wet and greasy surfaces in industry, printing, kitchens, etc.. Technical Data • POLYTEX DYES USED FOR BLUE COLOUR CLOTH ARE NATURAL • POLYTEX IS SUITABLE FOR ITS USE IN FOOD INDUSTRY • POLYTEX DOES NOT CONTAIN SILICONE Daevi SL • www.daevi.net • info@daevi.net Do you collaborate on humanitarian projects with Intermon Oxfam? We do. 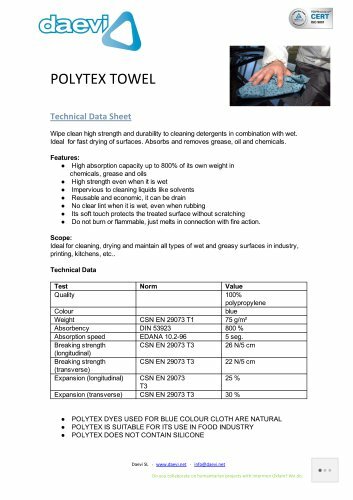 Presentations and accessories Polvtex© Towel Quality: 75 g/m2 Colour: blue Measures: 40 x 42cm / towel Packing : 12 pack of 35 folded towels = 420 towels/box Polvtex© bobbin Quality: 75 g/m2 Colour: blue Packing : 1 bobbin of 500 towels 32 x 38cm Do you collaborate on humanitarian projects with Intermon Oxfam? We do.